Cut broccoli into small florets. Finely chop chili pepper. Peel and finely chop garlic. Cut off the green leaves from bok choy and quarter the stalks. Set everything aside. Cube tofu and add to a bowl. Mix miso paste with chopped chili, garlic, and sesame oil in another bowl. Transfer tofu to the miso-marinade, mix well, and set aside. Add tahini, rice syrup, mirin, lemon juice, Dijon mustard, Sriracha, and soy sauce to a bowl and whisk until combined. Heat some vegetable oil in a wok and fry broccoli florets for approx. 5 min. Add bok choy stalks and fry for approx. 3 min. more. Add edamame beans, cashews, and marinated tofu and fry for approx. 3 min. further. Finally, add bok choy leaves, mint, and tahini sauce, and stir to mix well. Bring water to a boil in a pot. 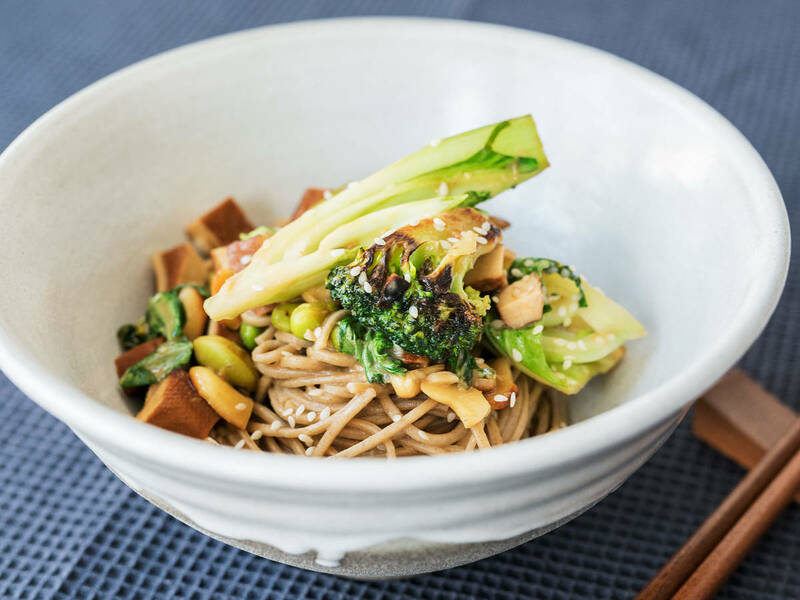 Cook soba noodles for approx. 3 min. and drain. Add soba noodles to the wok and toss gently to coat with the sauce. Season with salt and pepper, and top with sesame seeds. Enjoy!